A Symbol Of Compassion, Dalai Lama Hints Bin Laden's Killing Was Justified : The Two-Way In religious circles, whether bin Laden's killing was justified, has been a reason to soul search. The Dalai Lama seems to have arrived at a surprising answer. Tibetan Spiritual leader The Dalai Lama gestures as he talks to journalists in Dharamshala on March 17, 2011. Like the phrase "turn the other cheek" in Christianity, there's a central tenet in Buddhism that teaches forgiveness. It's in the Dhammapada, a book thought to come from the Buddha himself, in which he teaches: "'He abused me, he struck me, he overcame me, he robbed me' — in those who harbour such thoughts hatred will never cease." But what about killing someone like Osama bin Laden — someone who in obituaries has been compared to Hitler and Stalin? Should the U.S. have turned the other cheek? 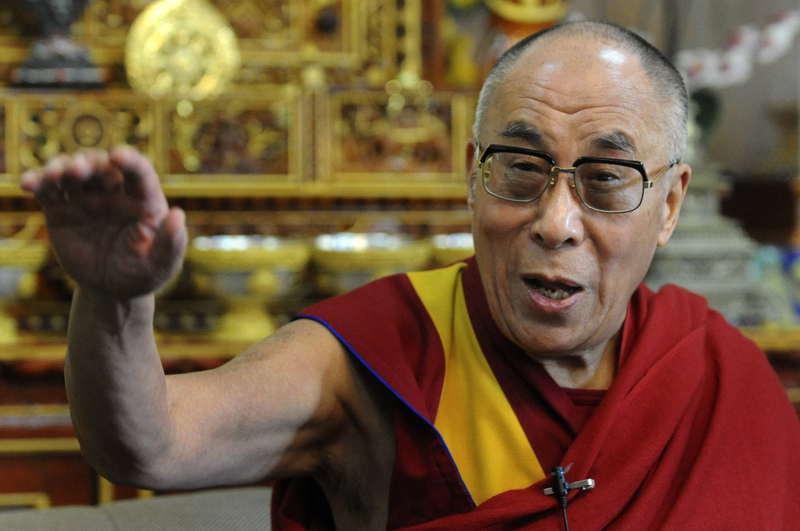 As a human being, Bin Laden may have deserved compassion and even forgiveness, the Dalai Lama said in answer to a question about the assassination of the Al Qaeda leader. But, he said, "Forgiveness doesn't mean forget what happened. ... If something is serious and it is necessary to take counter-measures, you have to take counter-measures." This, reports the Times, comes from a man who also said he tries to avoid swatting mosquitoes. "When my mood is good and there is no danger of malaria," he said, he watches as mosquitoes swell with his blood. Yet Christians are in the midst of the Easter Season, when Jesus, the innocent one, not only triumphantly rose from the dead but, in his earthly life, forgave his executioners from the cross, in the midst of excruciating pain. The Christian is not simply in favor of life for the unborn, for the innocent, for those we care for, for our families and friends, for our fellow citizens, for our fellow church members or even for those whom we consider good, but for all. All life is sacred because God created all life. This is what lies behind Jesus's most difficult command: "I say to you, Love your enemies and pray for those who persecute you." Faced with the death of a man, a Christian never rejoices, but reflects on the serious responsibility of everyone before God and man, and hopes and pledges that every event is not an opportunity for a further growth of hatred, but of peace." In his response, His Holiness emphasized the need to find a distinction between the action and the actor. He said in the case of Bin Laden, his action was of course destructive and the September 11 events killed thousands of people. So his action must be brought to justice, His Holiness said. But with the actor we must have compassion and a sense of concern, he added. His Holiness said therefore the counter measure, no matter what form it takes, has to be compassionate action. His Holiness referred to the basis of the practice of forgiveness saying that it, however, did not mean that one should forget what has been done.